PNS Garage Installations can supply you a full turnkey MOT package including full site survey, drawings, builders works and full fit out service to suit the client's needs; we also supply and install class I,II,III,V,VI and VII packages. The hassle-free service enables the customer to continue to run their business with minimum disruption. We also complete the paper work for your application (client needs to provide some information). Give us a call on 01706 647 334 or send us an email to find out more. We supply VTech, Ravaglioli and Eurotek complete MOT bays both as pit packages and ATL. We also supply MOT platforms, break testers, jacking beams, gas and smoke meters and headlamp testers. The "Fully Automatic" choice for the professional test centre. One of the most advanced test lanes on the market today, the Ravaglioli test and diagnosis system is the test lane choice for the professional test centre. Designed for cars and light commercial vehicles with an individual axle load of up to 2.5 tonnes, the modular concept of the system enables you to tailor the technology to suit the specific needs of your service and repair operation, whilst giving you the option to easily upgrade and expand the system as your needs change in the future. 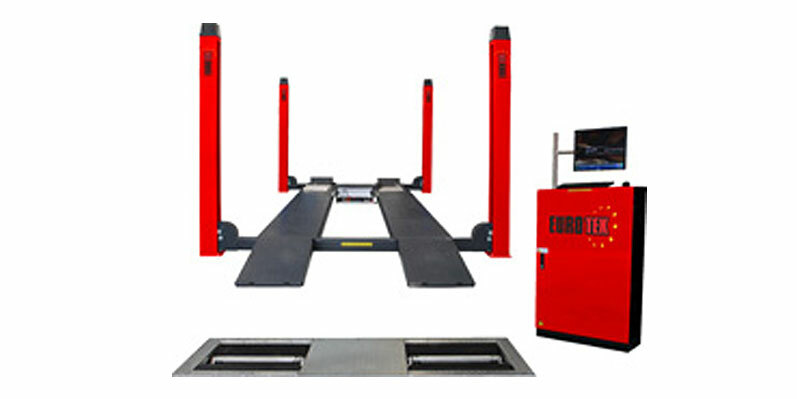 Eurotek is the latest in cutting edge automotive equipment, designed in Europe and manufactured in Shanghai, Eurotek are building a name in quality and reliability. Eurotek - The value for money and specification of Eurotek automotive equipment exceeds that of its rivals. Quality & Durability are what V-Tech Garage Equipment pride themselves upon. All of V –Tech garage equipment is made from high grade steel, solid platforms, secure fitting and is therefore built to last. Head Beam Setter- with analogical luxmeter, mirror visor, H base with double rail and rotating column. MOT protocol version. Give us a call on 01706 647 334 or send us an email to find out more.